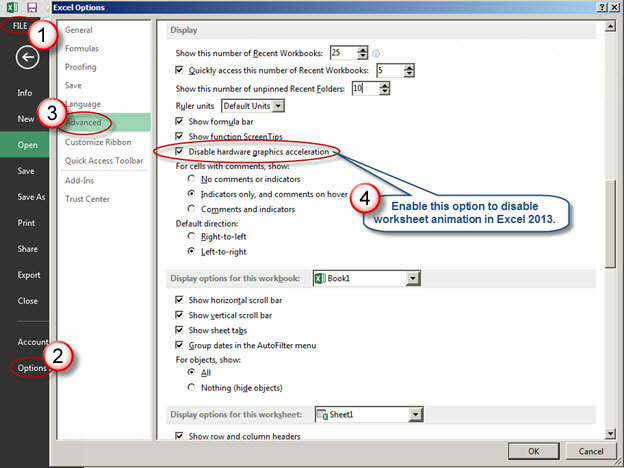 How to Disable Worksheet Animation in Excel 2013 » Accounting Advisors, Inc.
Excel 2013 has arrived, and for the most part, it's much like Excel 2007 and 2010, but with some spiffy new features, such as Recommended Charts and Pivot Tables, Flash Fill, Quick Analysis, Power View, and more. I'll be exploring these features in upcoming articles, but first I want to show how you can disable the eye candy if you choose. By comparison, worksheets in Excel 2010 and earlier were rather staid. You pressed Enter, and the cursor dropped to the next row with aplomb. In Excel 2013, the cursor wants to make sure that you realize it's moving to the next row, so it swoops its way there. When you change a formula, numbers flip like in a slot machine before settling into place. Click a few cells to the right, and the cursor visually whooshes into position. These features are probably helpful to a new generation that's never experienced a spreadsheet before, but it borders on seizure inducing for long-time spreadsheet users. Fortunately, there's a simple fix to tone down the animation in Excel 2013. As shown in Figure 1, click on File, choose Options, and then Advanced. Scroll down to the Display section and then enable the Disable Hardware Graphics Acceleration setting. Think of this as the “turn off the bells and whistles, please” option. Click OK and settle into working in peace with your spreadsheets again. 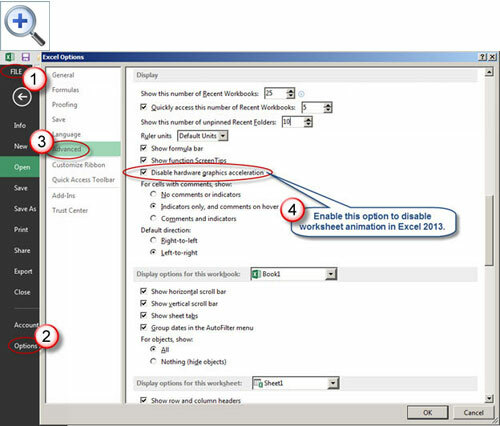 Figure 1: Enable the Disable Hardware Graphics Acceleration option to turn off worksheet animation. For good measure, once you change this setting in Excel 2013, as shown in Figure 2, choose File and then Account. 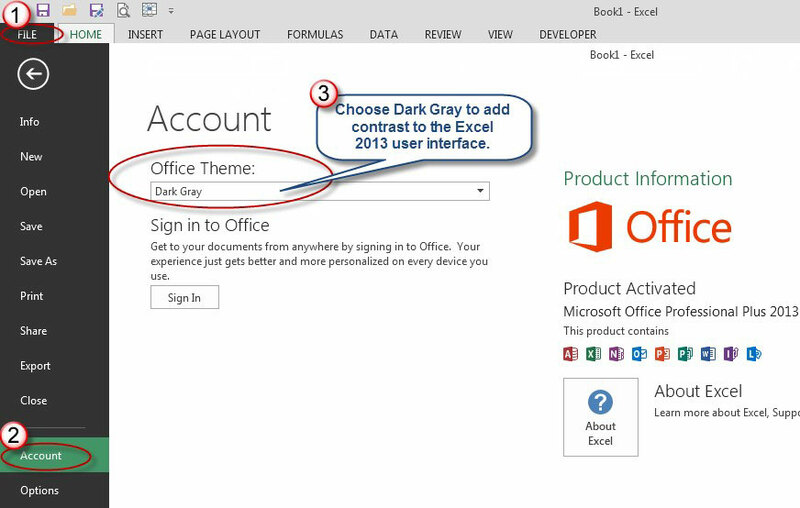 On this screen you can change your Office Theme to Dark Gray to add some contrast to the default, stark-white user interface. This screen is also where you can sign out of Excel if you sign in via the Sign In link in the top right-hand corner or through the Office Apps store. 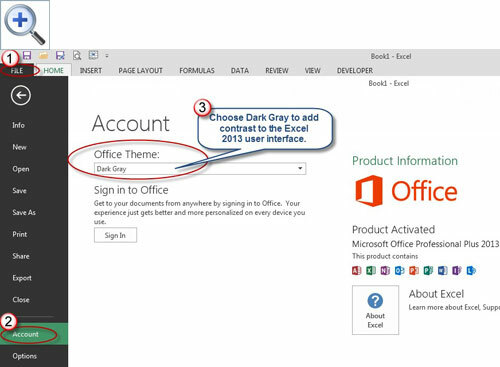 Figure 2: Set the Office Theme to Dark Gray if you find the Excel 2013's default theme to be too stark.